Hey, what's so funny, Dilbert? 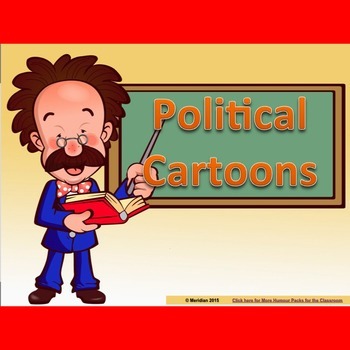 Help your kids understand the humor of the Political Cartoon. Sure, it is a high level form of humor that not everyone gets. But by studying the elements of the Political Cartoon, you never know, there just might be the next Dilbert in your class. Will you be responsible for holding them back by not showing them how it's done? Surely not. Here's the work done for you. 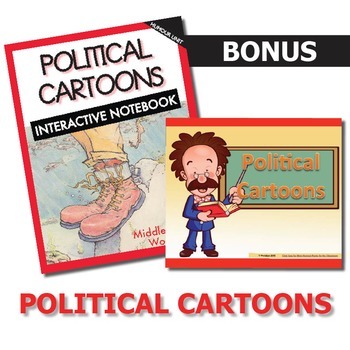 The Interactive Notebook is a fun, creative and engaging learning experience for each student, and this pack encourages students to acquire the skills to view and analyze the political or editorial cartoon. 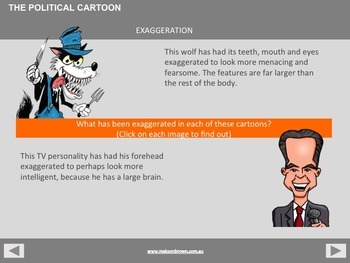 The final activities in the pack provides students with a template and practice to analyze political cartoons and make sense of their meanings and subtleties. There is a full preview available of the entire pack, so please check it out to see the quality of the product. The slide deck is professionally done and gives students a visual interactive learning experience. 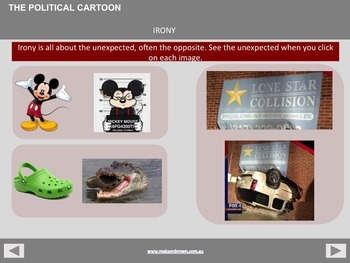 Note: This pack on Political Cartoons is not part of the Comedy Fun Bundle. 100% Money Back guarantee - if there is anything at all about this pack that disappoints or was not as expected, please get back to me and your investment will be completely refunded - no issue at all.